Elizabeth Gurney-Fry was born in May 21, 1780 in Norwich, England. She grew up in a home of a prominent Quaker family where her parents were both bankers. When she was 18, she was motivated by the preaching of an American Quaker, William Savery. With this, she grew an interest in serving the poor, the sick and prisoners by collecting used clothing for them, visiting them and teaching children in some neighborhoods how to read. Two years later, she met and married Joseph Fry and had a houseful of children, eleven to be exact. In spite of this, she always found time to help the needy by bringing warm clothing, medicine and freshly made hot soup. In 1813, she visited Newgate Prison in London. The social and hard living conditions of the prisoners tugged at her heartstrings. She saw that the women’s section was overcrowded with both women and children, with some prisoners not even been given a trial. The women prisoners did their own cooking and washing in small cells with straw beds for sleeping. Because of this, she formed the Ladies Newgate Committee, a group of Quaker volunteers who helped start a school for children of prisoners and she supported other prison reforms. She managed to grab the attention of others by the way she treated prisoners with respect, kindness and dignity. Elizabeth Fry also helped the homeless, establishing a nightly shelter in the city of London, and further actions led to the institution of the Brighton District Visiting Society where volunteers visited homes of the poor to provide help and comfort to them. 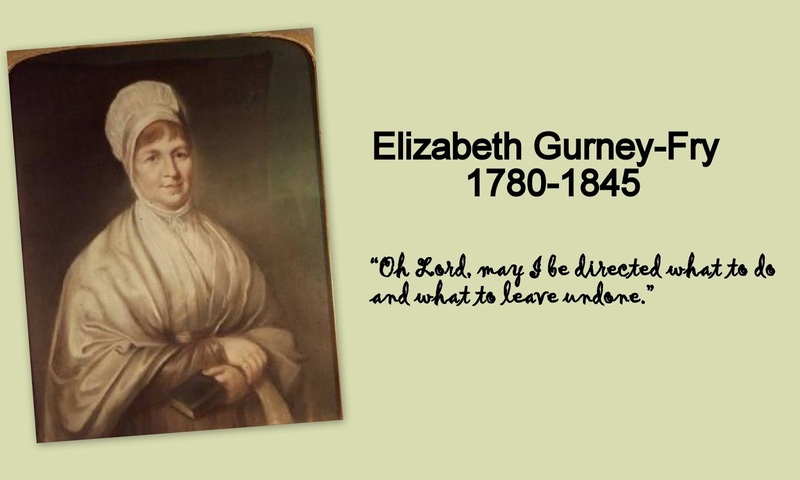 In 1840, she opened a training school for nurses, wherein her program inspired a young Florence Nightingale who then took a team of nurses to help wounded soldiers during the Crimean war. May we continue to be faithful and obedient to Christ’s examples, no matter where we are or the season we may be in.